Apple has replied to claims by Spotify that App store policies gave it an "unfair advantage". Spotify made its comments as it filed an official anti-trust complaint against Apple in Europe saying it "limited" consumer choice. "Spotify wants all the benefits of a free app without being free," it said. 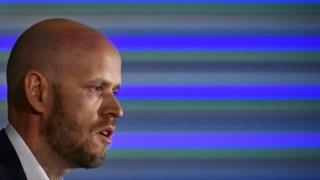 In a blog Daniel Ek, co-founder of the music-streaming service, said it had decided to file its anti-trust complaint because Apple had changed App store policies to "purposely limit choice and stifle innovation". In addition, the fees Apple charged for making purchases via the App store were, in effect, a "tax", said Mr Ek. He added that Spotify would have to raise the price of a premium membership for its streaming service if it paid these fees. However, said Mr Ek, firms that did not pay the fees were subject to "technical" limits that could stop them talking to customers. Apple hit back saying the App store let innovation thrive because all developers know that "everyone is playing by the same set of rules". It also said it had not hampered Spotify's ability to update its app unless the music service sought to "sidestep" the rules other apps follow. Spotify's claims about fees also got a rebuttal from Apple. It said that 84% of apps in the store pay nothing to Apple when they were downloaded or used. The fees Spotify criticised were levied when programs used Apple's own in-app secure purchasing system, it said. Fees halved after 12 months, it added. "We think that's wrong," it said. Writing on the Verge news site, Sam Byford said Apple had only addressed some of Spotify's criticisms. Questions remained about when fees were levied and on what types of goods, he said. "This week's PR blitz from both Spotify and Apple has been unprecedented, and it's unlikely that today's statement will settle the matter," he said.